That’s the centre they built inside the shell of the old Central Post Office, isn’t it? It was mildly posh when it opened, though it was kind of clear from the outset that it would probably go downhill quickly due to, well… location, location, location. I guess it must’ve opened somewhere around 2000 — well before even the half-hearted rehabilitation of the CBD had gained any momentum. I found it interesting that they kept the big, now-not-very-politically-correct murals from the post office’s old central hall in what became the shopping centre’s foyer. Some of these are actually beautiful, even if they do depict a white man’s history of the country. Ah, I just did a google, and here’s a photo on Flickr that shows the inside of the hall, though it misses the murals — they’re on the sides. I remember visiting the old Post Office often, well into the late 90s. 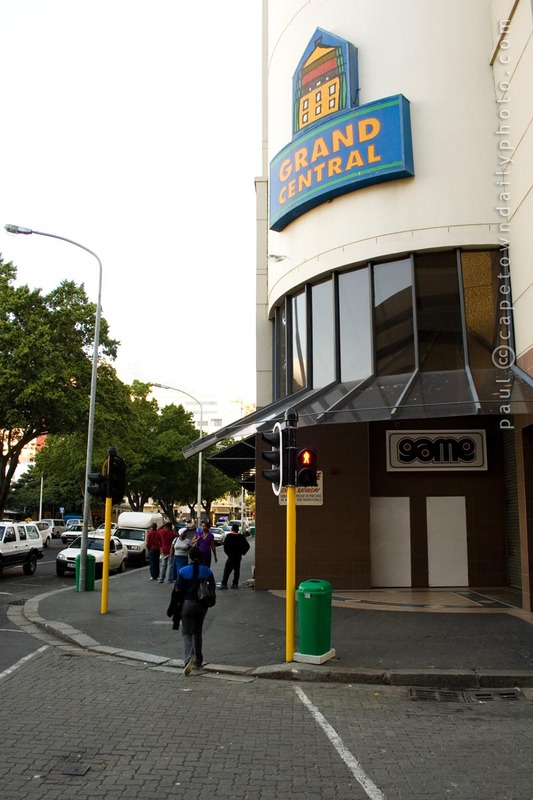 I worked in the CBD at the time, and I sometimes had counter-to-counter parcels delivered there to pick up over lunch. Agreed. It’s actually quite interesting inside. I’ve only been in a couple of times so I think a field trip is in order soon. I guess the fact that the old reminders of our country’s European past are up could be telling of the progress that we’ve made. Perhaps? I guess there’s no point in denying the past.